A gift of real estate to Faith In Action is a unique way leave a legacy. It is also a convenient way for you to enjoy a charitable deduction based on the current fair market value of your property and to reduce the size and complexity of your estate. Because a gift of real estate will usually be sold as soon as practicable after it is gifted, the real estate must be free of debt and must be readily marketable. Not only can real estate be used to make outright gifts, it can also be used to make future gifts to Faith In Action. For example, should you wish to give a remainder interest in a piece of real estate now but still desire to live in or continue to vacation in the property for the rest of your life, you may do so. This is known as a retained life estate. Gifts of real estate can be extremely satisfying, but they require careful planning. 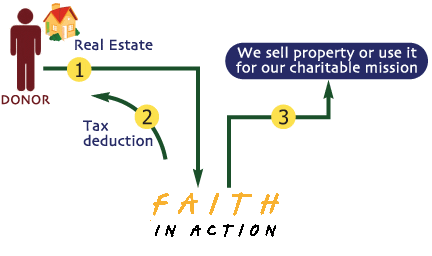 Any gift of real estate must be reviewed and approved through Faith In Action’s real estate acceptance policy, which require a donor to provide detailed and specific information about the property. The Development Office will work with you to facilitate this process. If you have any questions about gifts of real estate, please Contact Us. Call 757-258-5890 or email bminett@wfia.org. We would be happy to assist you and answer your questions.